Limbo is a hard place to be when you are three years old! My son’s room is stuck between a nursery and a big kid room. Read on to see what I have in store! Hi all! I’m sure you have been where I am right now if you have kids. Or at least I hope that a few of you have! He is my first, and I’m beginning to realize that 3 and a 1/2 is a strange limbo area. He’s not quite a toddler anymore, but he’s not quite a “big boy” either. I guess that’s why his room is stuck in between a nursery and a big boy room! It drives me crazy! The larger items that were left in his room after the bed transition were a twin bed, a dresser, a bookshelf that I made, some wall art, and an upholstered rocker. Below you can see the vision board for his nursery, a source list for the items on his board, and some pictures of his nursery! When I created the vision board for his room, I was going for a vintage vibe. 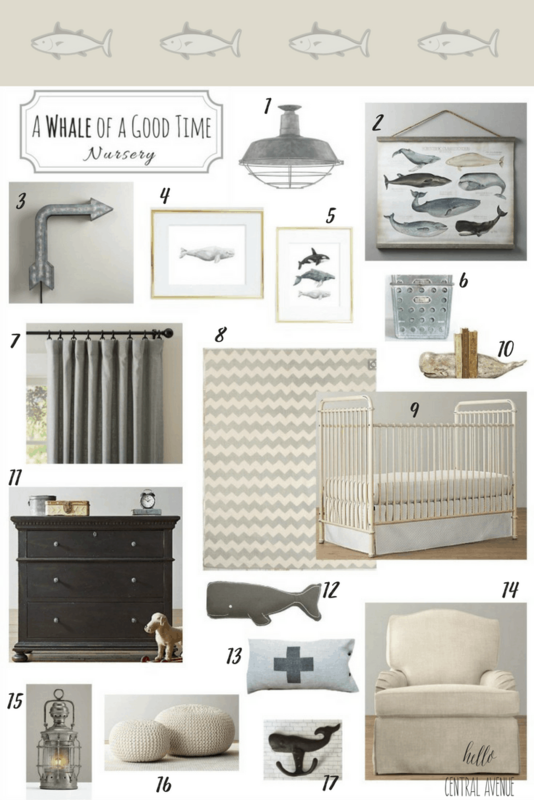 I came across the vintage style scientific whale tapestry at Restoration Hardware Baby and Child and fell in love with it! That is what inspired the whale theme. I pulled out very muted grays, neutrals, and blues from the tapestry for his room colors. I felt like it was very soothing. The fixtures in his room have a worn look to pull it all together. 1. galvanized option| 2. similar option| 3. similar option| 4. | 5. | 6. similar options| 7. | 8.similar option & other similar option| 9. similar option| 10. | 11. similar option & other similar option| 12. | 13. similar option| 14. one shown and less expensive option | 15. one shown and less expensive option| 16. one shown and less expensive option | 17. NOW it always seems like it’s a MESS! I am not a neat freak, but after a while, I start to get a little anxious about a messy space. It must be related to my control issues that I’ve pushed way deep down after having kids…because all control goes out the window when the kiddos arrive. Or maybe it’s just me. There are always a billion small loose toys that we are tripping over (insert picture of me pulling my hair out)! We have acquired so many books from generous friends and family, but they are always spilling over onto the floor or my son takes them from one place in the room to another. His room is small, so all of this mess just gets amplified! I know we need to give this kid a new look to his room and add in some features that were not so necessary when he was a baby/toddler. I have not created a vision board or a theme for his big boy room yet, but I know the following are KEY pieces in the transition from a nursery to a big kid room! I loved Finn’s nursery, and I am sad to see it go, but just like every phase of childhood, I can’t wait to see the next stage and give Finn a room that reflects his big boy self! At least I’m on the way to a less chaotic space! How have you dealt with the transition between a nursery and big kid room? Did you go cold turkey and redo the room completely or did you slowly transition your child? I’d love to hear from you!